‘JIMMA’ CARTER PUNCHED AS PLEASED OVER EGYPTIAN ELECTION……. – The Tundra Tabloids……. ‘JIMMA’ CARTER PUNCHED AS PLEASED OVER EGYPTIAN ELECTION……. A statement that we knew all along, Carter was just waiting to blurt out. 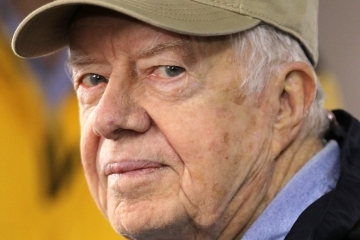 The Carter Center is one of the few monitoring group to have had a licence to witness the election, and the former US president will hold a news conference on Friday. Previous Post Previous Post OIC FOUNDED GROUP ISESCO PUBLISHES SCREED REJECTING JEWISH HISTORY OF J’LEM……. Next Post Next Post SYRIAN REGIME TORTURED BABY AFTER ARRESTING THE PARENTS……..
Jimma Carta, the liberal champion of dictators and oppressive regimes, should go back to picking peanuts. Nice to keep in the limelight . . no responsibilities . . just a license to make a pest of himself. Don’t know about a return to picking peanuts. At his age this could trigger low back pain due to acute soft tissue injury, and we wouldn’t want that now, would we.